Roulette happens to be a game of luck as there is no guaranteed strategy that will make the ball fall onto your bet. 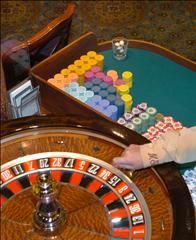 Still, there are several proven strategies that could help you win more consistently when it comes to roulette. American roulette comes with 38 pockets, two of which are 0 and 00. This would mean that the overall odds of hitting a certain number would be 1:38. If you choose to make an even bet, your odds at winning would be 18:38. On the other hand, a roulette wheel with a single zero only has 37 pockets; therefore, your odds at winning here with straight bets would be 1:37 and your odds at winning with even money bets would be 18:37. This difference may not seem like a lot, but when it comes to gambling real money at casinos, even the smallest difference could make a huge impact on winning or losing at the end of the day - keep that in mind. This is why you should take full advantage of better odds at winning with a roulette game that offers a single zero instead. There happens to be no such thing as "the greatest roulette bet out there". The ideal bet in roulette for you would simply depend on your goals at the game, your bankroll, and your overall personality. If your main objective at playing roulette is winning and losing a little at a time while playing for long stretches of time, try to make even-money bets, which cover eighteen numbers at once. Depending on what your luck is like, you might come to find that you actually win a lot of these bets in the long run. Conversely, if you like taking high risks with hopes of reaping high rewards, try out straight bets on one number alone. Winning bets on a single number happens to pay out at 35:1, so you could get a profit of $350 from a single $10 bet. Naturally, you will not win this way too often; however, it would still prove to be a great jackpot in the end. There is an interesting rule in French roulette known as La Partage. With this rule, you can place an even-money bet and if the ball falls on zero, you will only lose half of your bet. Though only slightly different from regular roulette rules, it could make a huge difference when gambling for actual money at roulette. Therefore, if you want to make an even-money bet in roulette, opt for French roulette instead to get better odds.